Lawsuits have been filed to remove Arkansas’ monument of the Ten Commandments from the State Capitol lawn. Planned Parenthood has stopped performing abortions in Arkansas, leaving only one abortion facility in the state. 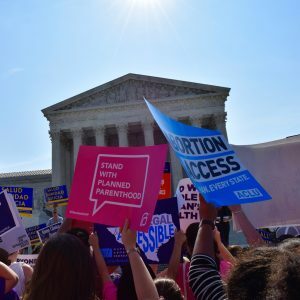 After months of waiting, last week the U.S. Supreme Court rejected a challenge by Planned Parenthood against a pro-life law passed by the Arkansas Legislature in 2015. Since then the Eight Circuit Court of Appeals issued an order saying the law must be enforced. This is great news on the pro-life front! This means that the ruling by the Eight Circuit Court of Appeals upholding the law will stand. This law, championed by Rep. Charlene Fite (R — Van Buren) and Sen. Linda-Collins Smith (R — Pocahontas) passed the Arkansas Legislature with only 12 dissenting votes. It requires facilities that perform drug-induced abortions to contract with a doctor who has hospital admitting privileges. Presented with evidence that drug-induced abortions are more dangerous than surgical abortions, the Arkansas Legislature found that to protect the health and safety of women, a law was needed to require doctors who perform abortions to operate by the same standards that most doctors already follow. Now that his law is in effect, the two existing Planned Parenthood facilities in Arkansas have stopped performing chemical abortions. According to Planned Parenthood, their doctors have been unable to find a hospital that will grant them admitting privileges, and they say no doctor who has admitting privileges will contract with their facilities to help them follow the law. Arkansas has about 6,000 licensed physicians, and a majority of them have admitting privileges with one or more hospitals. Little Rock’s Caring Hearts Pregnancy Center, a pro-life organization that helps women with unplanned pregnancies, reported on Thursday that the number of women seeking their help had increased. This increase has been attributed to the burning of the Little Rock Pregnancy Resource Center and changes at Planned Parenthood. The ACLU and Planned Parenthood are now building their case for another legal challenge in federal court. We expect them to try to present evidence that enforcement of this law is creating an “undue burden” for women seeking abortion. With the help of Americans United for Life, Family Council worked with the Arkansas Legislature to draft this law, and Family Council staff members Charisse Dean and Ken Yang led the lobbying effort for the bill’s passage. Governor Asa Hutchinson signed the bill into law, and Arkansas Attorney General Leslie Rutledge’s office worked hard to defend this good law in court. This was a team effort made possible by scores of people all working together. It is important to note that several other good pro-life bills are pending in court. If these laws are upheld, Arkansas will be taking giant steps toward being the most pro-life state in the nation.